what else but our costumes! How will you dress? What will you be when you can be anything for one night? This ancient holiday has evolved and etched its way into our current history. It is adored as we enact our joys and fantasies in a safe experience of ghouling and receiving. But why? If we look at it from a stranger’s point of view, one might ponder what this Halloween phenomena is all about. One of the eight turnings of the wheel, Halloween’s origins are as old as the archetypal characters people enact. Each “turning of the wheel” is a term for an interval period about every 6 weeks. Therefore, 8 “turnings” occur in a year, called the “Wheel of the Year”. These moments are a time to reflect upon seasonal changes and prepare for the next season. 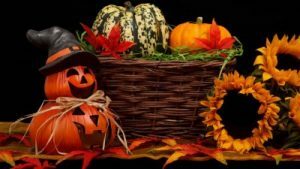 They also involve a notable aspect in the relationship of length of day and night, as in the case for Mabon, around September 22nd when day and night are at equal lengths. Or summer solstice when the day is longest, and Yule, when the day is shortest. October 31st/Nov. 1st is a six week interval. As with each turning of the wheel, communities would take a break from work to celebrate. This is how the term “Holiday” or “Hold Day” came to be. And Halloween the strangest of them all! So what will YOU be? And why does this solstice play with costumes? The donning of costumes at Samhain may only be about 600 years old, possibly originating in Scotland. The Celtic pagans dressed in animal heads and other ghastly characters as a means to protect themselves from evil entities that could cross over at this time of year when the “veil is thin”. This solstice recognizes the idea of a veil between our “world” and the world of “the dead”. At the same time, in Mexico and Central America, Dia de Muertos is a celebration of the dead, believing that the dead could cross over and we could communicate with them at this one auspicious time. Dia de Muertos originates from the Aztecs, and it is customary to dress and act in honor of the ancestors, donning elaborate decorations, skeletons, skulls and altars. And ritual! And pumpkins! The pumpkin carving ritual stems from Ireland when turnips were carved with ghoulish faces and lit with a candle as a way to ward off evil spirits. In the 19th century, shifting to a larger gourd called a “Jack-O-Lantern”, pumpkin carving has become a popular re-enactment of olde ways as well as a booming agriculture. With this new tradition, farmer’s have yielded more pumpkins than were ever. Despite the various customs and origins, to this day we create fantastic settings, dress in outlandish costumes, build succulent feasts and decorate cornucopias to represent the fruits of our labors. And you thought you were just having fun! The Celtic pagans set their tables to honor a place for your late grandparents and other loved ones, a plate for each full of food, awaiting their visit. The harvest is completed. Now we feast with the dead. So this is Halloween today. We remember our family and those gone before. We remember the hard work and the yield we have cultivated. Decorate ourselves and our homes and give each other gifts of candy and dress to scare away evil or to scare each other. We dress to honor the spirits and to enjoy our moment here on earth or we dress up for fun. A strange collage created over centuries, under the warm glow of the fall sunset and all the ghouls aloft, we play and emulate what is in the air. Light a candle. Build an altar. Carve a pumpkin. Give a gift of food. Dress up for the event of life and celebrate! We hope you have a safe, scare filled and candy stuffed Halloween.